Most schools and businesses that go Google take advantage of the whole suite of apps, including Gmail. This little tip is a great timesaver and will help get you to inbox zero in no time! First, let's talk about filters. 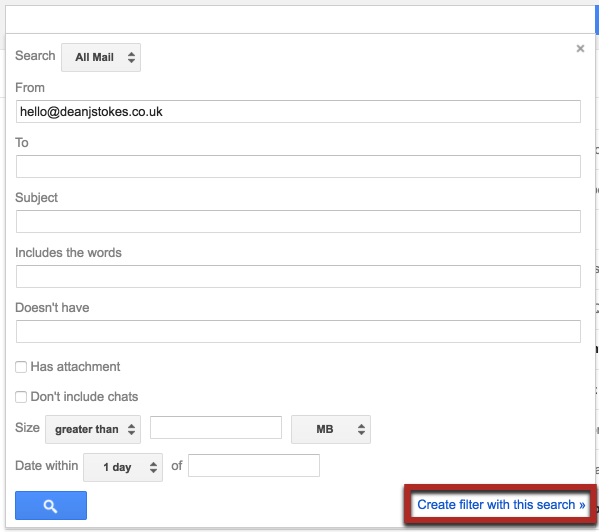 Filters allow you to automate certain tasks in Gmail - like labelling emails and archiving them so they never hit your inbox. I find them really helpful for filtering out updates from social media that I want to read, but that I don't want to distract me in the middle of the day. They're super simple to setup - just click the small arrow on the right of the search box, type your criteria, then choose 'Create filter with this search' in the bottom right of the prompt. Now, here's the really good part... Did you know that you can manipulate your email address but still get all your email delivered? The magical + sign allows you to quickly create extra addresses that all come through to your inbox. Here's how it works - just put a '+' after your username, followed by anything you like, before completing the address in the usual way. For example, my email address is hello@deanjstokes.co.uk. I could sign up for a newsletter using hello+newsletter@deanjstokes.co.uk and the email still hits my inbox. I could sign up for LinkedIn and use the email hello+linkedin@deanjstokes.co.uk. Now all of my newsletter emails get caught under one label and I don't have to spend time manually organising. Good luck with your journey to inbox zero! 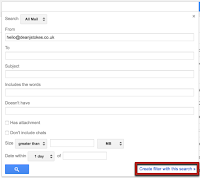 3 on: "Organise Your Email Before it Hits Your Inbox #gafetip"